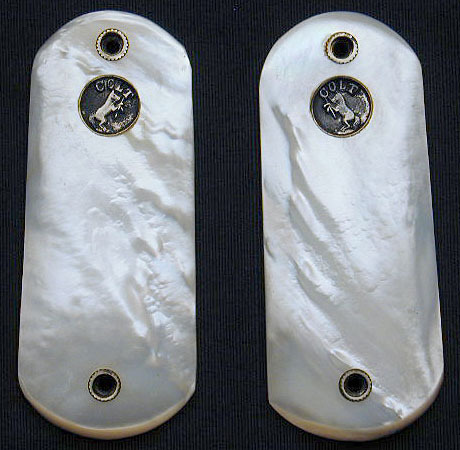 Model 1903 Pocket Hammer serial number 43910 Pistol features standard blued finish and factory recessed medallion mother of pearl grips. 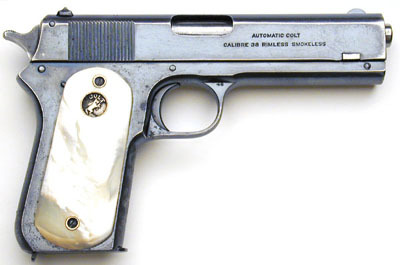 Colt factory letter confirms that this pistol was a single gun shipment and shipped with blued finish and mother of pearl grips to A.J. Harwi Hardware Co., Atchison, Kansas and sold to O.B. Foalson Lumber Company on May 9, 1922. 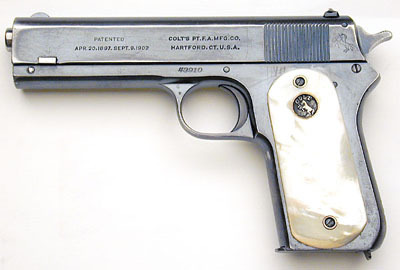 This Colt was located in Bonham, Texas with its original holster. The work was processed on Colt Factory Order number 3966/1. 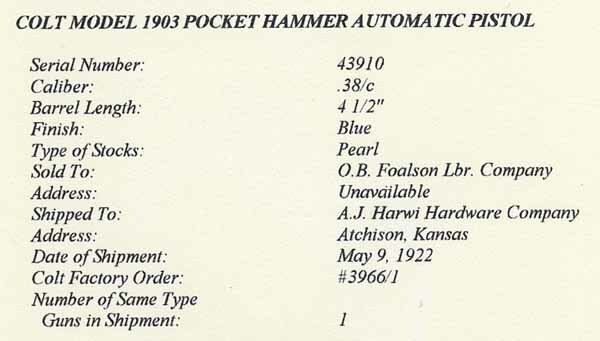 Colt 1903 Pocket Hammer .38 ACP serial number 43910 - right side. ALFRED JONATHAN HARWI was one of the great merchants of Kansas. Beginning as an obscure hardware dealer in Atchison he built up a business which now stands as a monument to his energy and foresight, the A. J. Harwi Hardware Company being one of the leading wholesale concerns of the Missouri Valley. Life extended to him only the opportunities which it extends to every one. It was his own personal character, his enterprise, and a vigorous and resourceful mind which enabled him to seize and develop possibilities into realities of a large and imposing character. While he would be mentioned prominently among any group of successful Kansas merchants, it was not alone for his material achievements that he is remembered and honored. He put character into his business, and it was the flowering of his character that earned him such wide esteem. His birth occurred at Ritterville, Lehigh County, Pennsylvania, January 21, 1847, and he died at Atchison September 5, 1910, at the comparatively early age of sixty-three. His parents were Michael and Lucretia Harwi. Michael Harwi for many years followed the trade of carpenter. He was engaged in some of the heavy construction required in the building of canal locks when canals were still the principal means of transportation in the eastern states. He had a farm also, and for a few years before his death was engaged in the quarrying and contracting of slate materials. He and his wife were the parents of four sons, Alfred J. being the oldest, and one daughter who died in Pennsylvania in childhood. One of the sons also died young. The other three sons all came to Atchison, Edwin C. and W. H. following their older brother and becoming associated with him in the hardware business. Edwin C. Harwi died September 4, 1903, while Wilson H. died May 30, 1911. His sons having all gone to the West, Michael Harwi prepared to join them in Atchison. On the point of his departure on October 8, 1882, he was taken ill and died. His widow, Lucretia Harwi, subsequently removed to Atchison and lived with her children until her death in 1904. Alfred J. Harwi was educated in the public schools of his native state. Up to ten years he found his educational opportunities entirely in his home locality. He then entered a noted Moravian school at Bethlehem. This school was four miles from his home and a high mountain ridge separated the two places. This rather difficult journey to and from school Mr. Harwi made night and morning for two years. He applied himself diligently to his studies and besides what he learned from books and associations with school masters he acquired an even larger and better knowledge by the study of books in his leisure hours and by active contact with men and affairs. He gained his early business experience as clerk in a general store at Bethlehem. It was the same kind of training school that has equipped many of our great merchant princes in America. He early formed the habit of reading, listening and learning, and was constantly engaged in broadening his mind and proving his judgment and ability to think promptly and concisely and decide with a minimum of the element of error. His early ambition was formed to become a business man on his own account. In 1868, at the age of twenty-one, he invested his very meager savings as a partner in a furniture store with J. B. Zimmele as partner. Two years later he sold out and started for the West. While living at Bethlehem, Pennsylvania, Mr. Harwi married his first wife, Cora Wheeler. With her father he subsequently was in the hardware and implement business in Missouri. After the dissolution of the partnership Mr. Harwi went to Cedar Rapids, Iowa, and worked there for a few months in a hardware store. It was in 1875 that he arrived in Atchison. He had a very generous equipment of business experience, but little capital. Associated with C. H. Dearborn he started a retail hardware business. It was in a small building at 408 Commercial Street, the stock was not all embracing, but represented practically all the active capital of the partners Mr. Harwi knew his goods, understood the art of salesmanship, and acting on the principle that success in a business is only an adequate reward for real service he soon had the store prospering and rapidly growing. In a few years the Harwi establishment was considered one of the leading enterprises of the City of Atchison. The late Mr. Harwi was possessed of a wonderful fund of common sense. At the same time he was a man of vision. He was not a dreamer of dreams, and when his ideas and ideals could not stand the test of experience and reason he discarded them and used only what could be translated into concrete results. He was in Atchison when that town stood at the parting of the ways, one leading to metropolitan prosperity and the other to comparative obscurity as a small country town. Mr Harwi foresaw the possibilities and was one of the biggest factors, indeed he might almost be considered a cornerstone in Atchison's growth and subsequent progressive development. He planned and worked so that his own establishment might be in a position to serve the developing western country with goods, and the success of his own firm was closely identified with the prosperity of the city at large. To make Atchison a gateway of commerce and a distributing point for a large section of territory, the essential elements were business houses powerful enough to develop the trade. Having formulated his plans Mr. Harwi devoted himself with unremitting energy the rest of his life to building up a great jobbing and wholesale house. From ideas that originated in his own brain and were translated by his own energy the A. J. Harwi Hardware Company came into existence and has since become known throughout the West and Middle West. Before he passed away his house was represented by twenty traveling salesmen who carried the goods of this firm over four states. More than fifty employes were employed to handle the office work and the warehouse and shipping details in the main establishment at Atchison. The company's home is a commodious four story office and warehouse building located at the corner of Commercial and Ninth streets, and it is one of the imposing landmarks in the wholesale district of Atchison. The warehouses contain 75,000 square feet of floor space, and it is an exceptional condition when this place is not packed with the vast and varied stock distributed by the company. The A. J. Harwi Hardware Company was incorporated in 1889 with a capital stock of $100,000.00. During his later years the stress of business and ceasless activity told heavily upon Mr. Harwi's physical resources. For the last twenty-five years he was a sufferer from locomotor ataxia. But he never gave up, and in the accomplishment of his large plans he did not spare himself as much as he should nor take efforts to conserve his bodily strength. Thus it was that the span of his life was shortened, though he lived to realize the fondest dreams and anticipations of his earlier career. Mr. Harwi's first wife, Cora Wheeler, died leaving one daughter, Mrs. E. P. Ripley, of Boston Massachusetts. For his second wife he married Elizabeth Whitehead, of Atchison. They were married in 1873 and she died in 1907. Her two children are: Mrs. H. P. Shedd of Bensonhurst, Long Island, and Frank E., now president of the A. J. Harwi Hardware Company. On June 3, 1909, Mr. Harwi married Mrs. Mary E. Holland, who survives him. The City of Atchison has grateful remembrance of Mr. Harwi's thorough public spirit and generosity. He contributed to all worthy charitable and philanthropic causes, and was a wise steward of the fortune which accumulated under his efforts. He naturally had the handling of large investments, but he was never known to take advantage of a debtor and foreclose a mortgage. In church affairs he was a member of the Congregational Society, was a trustee of Midland College at Atchison, and established and endowed the Harwi Scholarship prizes, which have been of such benefit to many young students. He was also a trustee of the Atchison County High School at Effingham and education was always a cause close to his heart. Only once did he participate actively in political service. In 1884 he was chosen state senator from the Atchison District, and served creditably during the following sessions. He made a splendid record, and on its basis his friends mentioned him as party candidate for governor, though the movement never received any encouragement from him. His heart and soul were in his business, and even while he was a member of the Legislature and after a day spent at Topeka he would return home and put in the greater part of the night in the supervision of his business.